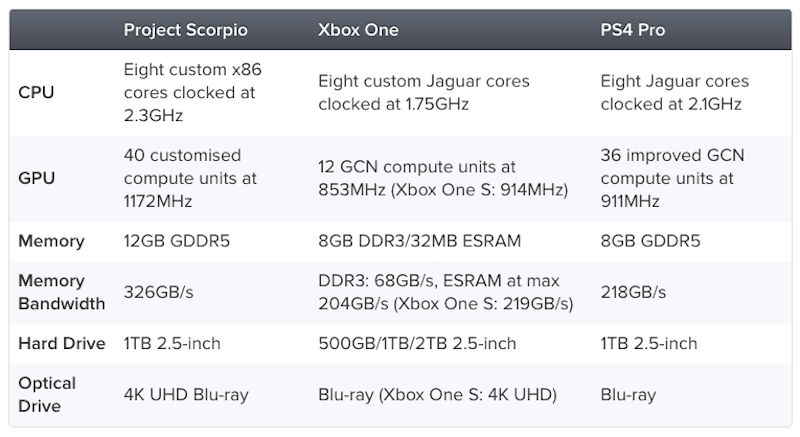 Project Scorpio – Microsoft’s Xbox One upgrade had its internal specifications revealed in full for the first time. Revealed by Microsoft, the Scorpio – which still doesn’t have an official name or retail price – is a more significant upgrade to the current Xbox One. The CPU is 30% faster than the Xbox One, with the GPU 4.6 times more powerful. Its RAM and hrad drive read speeds have also improved, meaning 4k resolutions should be easily achieved and maintained. Scorpio also features vapor-chamber cooling inside, a technology that’s used on high-end PC gaming cards like the GTX 1080. All of this is said to be packed into hardware that’s described as “compact”. Microsoft also mentioned the Scorpio will utilize spatial surround sound that current Xbox One consoles can take advantage of. Furthermore, Microsoft has confirmed all existing Xbox games (including Xbox One Backward Compatible titles) will run smoother, look better, and load faster without requiring any update. Microsoft has said that the final form of Project Scorpio will be revealed at E3. This suggests that Microsoft isn’t planning to showcase anymore of the hardware before its E3 press conference. All eyes will now be firmly set on Microsoft come this June. Now we wait and see what Microsoft has in terms of exclusive games and just how competitive it will be in pricing.